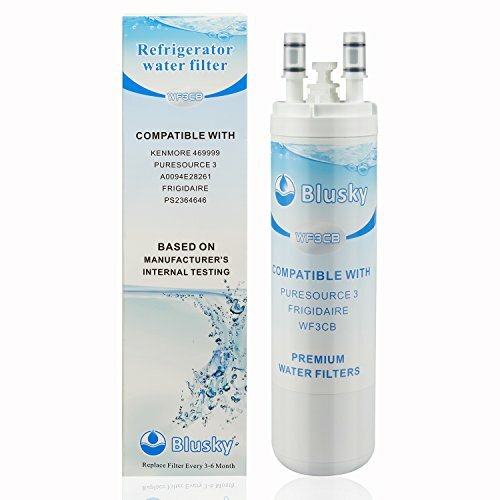 Notice Flus 4 gallons (15.142 liters) of water through water filter cartridge before use. Health water & Better tasting --Delivers clean, clear water, create better tasting water for drinking. Will fit in all compatible refrigerators. This filter use activated carbon to reduces chlorine taste, odor, sediment, dirt, rust,turbidity,heavy metals and harmful sediments .At the same time, does not remove beneficial minerals. Activated carbon is tested and certified Standard 42 for the reduction of Chlorine Taste and Odor. EASY INSTALLATION : No special tools required. Compatible with W/Mag/KitchenAid/Jenn-Air/Amana fridges and ice makers . Just insert water line into built-in plugs eliminating the risk of leaks. Replace filter every 6 months or 200 gallons to maximize contaminant reduction. View More In Faucet Water Filters. If you have any questions about this product by Realwater, contact us by completing and submitting the form below. If you are looking for a specif part number, please include it with your message.